Unlike mainstream media ShareCafe readers would have already had a good idea of the impact the January 2 tailing dam disaster at a Vale iron ore mine In Brazil’s Minas Gerais state, boosting prices on top of a solid rebound from lows last November. Regular media have just cottoned on to the slowly growing impact of the disaster on Vale’s production, cutting exports, and pushing global prices higher, although the rise has been uneven. The main indicator price – the Metal Bulletin 62% Fe (iron oxide) price landed in northern China is around $US86 a tonne (it topped $US90 a tonne in February before retreating). The price at Monday’s close is 17% above the level on January 24, the day before the dam wall collapsed. Now there’s even more pressure in global iron ore supplies and prices after Vale was forced to shut two more iron ore mines in southern Brazil. Over the weekend, Vale said it would cut production at an iron ore mine in the state of Minas Gerais. It also said that it would suspend operations at a separate facility, coming on top of temporary closures already announced following the January 25 disaster. The mine alone will take an extra 12.8 million tonnes a year of ore off the market. It takes total expected gross capacity closures from Vale to a run rate of 83 million tonnes per year, which is a significant 5.7% of the seaborne iron ore market,” according to US investment analysts. According to the Metal Bulletin, the news saw the spot price for benchmark 62% fines jump 2% to $US88.26 a tonne on Monday, the highest level in a month. 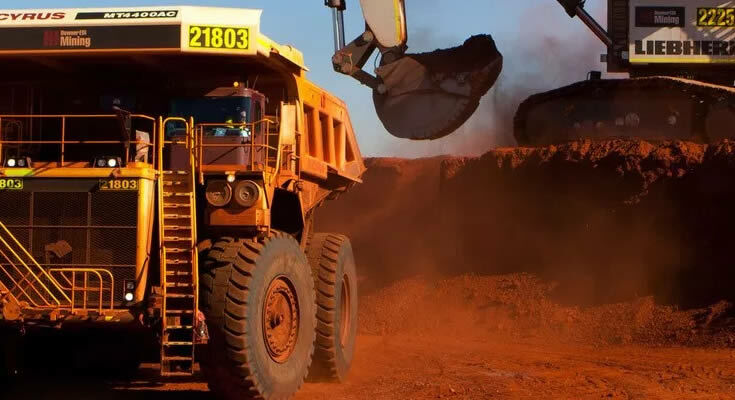 The news saw the prices of shares in BHP rise 1.7% to $37.59, Rio Tinto by 1.7% to $94.75 but Fortescue shares dipped 0.1% to $6.82 after a strong rise on Monday. Production has been indefinitely suspended at Vale’s Timbopeba mine, according to Friday’s announcement. The company later received a fresh order another two dams — Minervino and Cordao Nova Vista. The same day, prosecutors took a separate action, seeking guarantees of 50 billion reais (or roughly $US13 billion) for environmental restoration. The Bank of Montreal analysts now expects the Brucutu mine to restart production in the fourth quarter, cutting 23 million tonnes from Vale’s 2019 production, while the suspension of operations at Timbopeba cuts the forecast by another 8 million tonnes. “In addition to the block of funds, the decision also requires that Vale pays for the sheltering, lodging, maintenance and feeding of the removed people, besides the adoption of other measures aiming to grant assistance to the affected community,” the court said in a statement. Analysts at Wood McKenzie reckon the supply cuts could top 50 million tonnes in 2019. The announced cuts now total some 83 million tonnes, but some analysts reckon some of the shut capacity won’t be permanent. Meanwhile, Reuters reported yesterday that the impact of the closures and the disaster are starting to show up in iron ore export figures from the government. Reuters reported that according to trade ministry data released on Monday, Brazil’s iron ore shipments for the first two weeks of March were 1.29 million tonnes a day on average. Shipments in February averaged 1.44 million tonnes a day while in March 2018 they averaged 1.42 million tonnes.